Anytime you move, you meet new people, and they’re often curious about the place you came from. You instantly become a spokesperson for your most recent residence— so talk about more than the typical climate and the well-known landmarks. When you move away from Northern Florida, make sure to point out these high points of the region. Other areas of Florida, notably Orlando and Miami, may be better known as tourist destinations, but Northern Florida attracts its share of visitors as well. The oldest tourist attraction in the state can be found in Silver Springs, Florida. These natural artesian wells became a nationally designated landmark in 1971, but the tourists started visiting shortly after the end of the Civil War. Over the years, visitors to Silver Springs have seen more than the artesian wells. Early developers introduced glass-bottom boat rides. In the 1930s, guests could take a “Jungle Cruise” to nearby islands. Several movies filmed scenes there, including a Tarzan adaptation starring Olympic swimmer Johnny Weissmuller. Famous visitors include President Ulysses S. Grant and “Crocodile Hunter” Steve Irwin. Elvis Presley held one of his first concerts there in 1956. He performed in the city a total of eight times, including once a few months before his death. Jacksonville could be considered an early center of American moviemaking. More than 30 movie companies were based there around 1916, but citizen complaints forced them out of town (and across the country to the other sunny state). 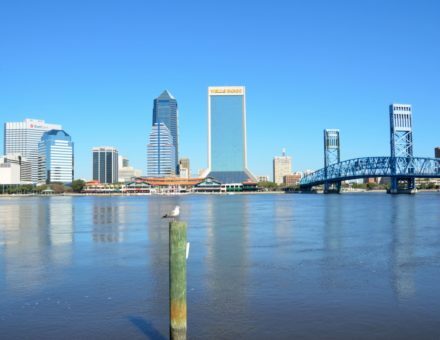 The St. Johns River flows through the city. This river is one of only two in the US that flows north rather than south. This city, named for President Andrew Jackson, deserves to be one of the most well-known Florida metro areas. If you have any interest in flight, you know the Blue Angels. This division of the US Navy actually includes pilots from both the Navy and the Marines. The pilots regularly perform shows across the country to demonstrate advanced aerial maneuvers. More than 11 million people watch them perform feats of flight every year in more than 70 annual public demonstrations. The home base of the Blue Angels is in Pensacola, Florida, a city in the state’s westernmost county. When they aren’t at air shows, Blue Angel pilots practice in Pensacola from March to November. Interestingly, the name “Blue Angels” doesn’t have military origins. A pilot actually got it from a New York City nightclub he read about in The New Yorker. People think of Florida as one of the warmest US states, and Tallahassee, the state capitol, lives up to that reputation most of the time. Summer days sometimes reach triple-digit temperatures. But Tallahassee isn’t exactly a stranger to cold either. It’s the only city in Florida to have a negative temperature on record. It reached -2 degrees Fahrenheit on the day before Valentine’s in 1899. Of course, the temperatures aren’t the only things that set Tallahassee apart from the rest of the state. Both Florida State University and Florida A&M University are based here. The top floor of the capitol building features beautiful views of the entire city, and the public is welcome to visit and take in the view. Even car enthusiasts and history buffs can find something to love in Tallahassee. The Tallahassee Automobile and Collectibles Museum holds not just one but two feature film Batmobiles-the versions from “Batman Returns” and “Batman Forever.” The museum also displays Abraham Lincoln’s horse-drawn hearse. Amelia Island. Close to the Jacksonville area, this resort-like community lets visitors explore the sandy shoreline and step back in time while wandering the downtown area of Fernandina Beach. Fort Walton Beach. This beach in the panhandle is perfect for families. Although some locals refer to the area as “Redneck Riviera,” people enjoy snorkeling and viewing watery wildlife on this stretch of the Emerald Coast. George Island State Park. This location is well suited for beachgoers who want the full outdoor experience. Visitors can camp in a pine forest and enjoy a larger portion of what outdoor Florida has to offer. This sample list proves that Northern Florida’s beaches have something to offer everyone-sunbathers and adventure-seekers alike. As you prepare for a move away from Northern Florida, think back on all the great experiences you had in the area. Hopefully, this list jogged your memory and will help you solidify your memories of your time here. Remember to call Wheaton World Wide for help with your move!